Install of XVM for 8.10 was smooth as butter this time. I opened the zip file and replaced all the components already installed. And I finally figured out how to set the “Efficiency” rating style, which can be either “Efficiency”, “WN6”, “WN7”, or XVM versions of WN6 and WN7. I think that’s what those mean, but I’m not too sure. The way to do it is take a default configuration file with statistics enabled. Then, search it with a text editor. Replace all “XWN” instances with “eff” and bingo, you are using the old school efficiency score. One would think this important of a feature would be in the otherwise excellent config file editor, but one would be wrong. Or I don’t know how to access it. Now, I should probably find a better config file, I miss some of the features from he11raisers already. The tip about using replays is perfect, it made troubleshooting much easier. I played matches, and recorded replays. Then as I messed around with XVM config, I would run the replay and see if the statistics would show up, and eventually they did. As a bonus, my son laughed his head off watching them speeded up and slowed down, as I accompanied with a voiced “Ride of the Valkyries”. I elited my new Tier 1 Japanese tank in the first battle, by winning with 3 kills. The crew started out with 100% experience and I set them to work on camo, and plan to ignore them from here on out. 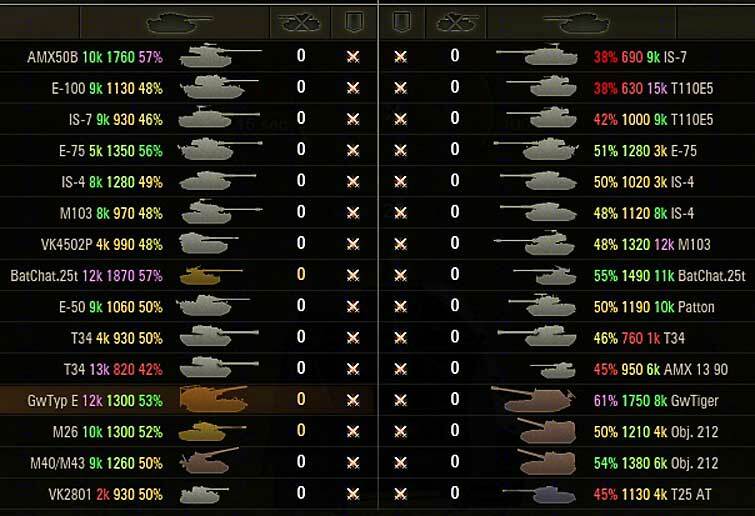 Even I, a big Tier 1 guy, don’t want another tank just like the Chinese and Russian ones. Reco’s tech tree does not seem to be available yet for 8.10. But I wanted to try out those new hangars as well, and am now using the Tech hangar. Matches for the night were spectacularly unsuccessful, but I did manage to elite the Chaffee with its final engine upgrade. I was irritated by the change in missions status – the IS-6 missions don’t show up in the battle results. You have to click the binder in the top left, to see what your progress is. Minor irritant I suppose. So if nothing else I’m set up pretty well for patch night. If you read the official forums you’ve probably heard about the XVM mod. This mod shows you ingame, statistical information and gives a win/loss prediction. I decided to install it this weekend and try it out. First, it’s definitely a grognard’s tool. It clearly has a ton of features if you want to dive into editing a config file like a madman, using a text editor. I only got as far as playing a few games. Took me far too long to figure out how to get it to work – I am doing this as I’m distracted by the normal family things happening when everyone’s home. But eventually I started a battle, and found a screenful of extra information to mess with. Right at the top is a win rate prediction – which is done by either your tank, or by your global account. They have a server that scrapes player data on a weekly basis, so you can’t expect to see this change during your session; and it apparently draws this info and makes the calculation. Win Rate (as a full %). I’m 50%. Efficiency (As calculated by these guys) in battle. I’m 1120. Number of games played (in k’s). I have 9k, because it rounds up my 8830 games. It seems like this is useful information to have in the battle. If I know the guy hollering out to rush the middle with everyone, has less than 1,000 battles, he probably doesn’t know what he’s talking about. On the other hand, the guy with 13,000 and 56% wins might have a point. It’s kind of fun information. As far as I could tell (I didn’t write anything down), the prediction was correct in my last 15 battles each time. It might not have been correct when it’s saying you have a 51% chance to win – but always on the bigger numbers. I played a battle on the Mountain Pass, and we supposedly had a 70% chance to win. I rolled out along the north pass, and watched as five of our players promptly got knocked out, no enemy casualties. But we came back – I took out four of the enemy with my SU-85b cannon of death; the enemy really did not know how to assault the north. 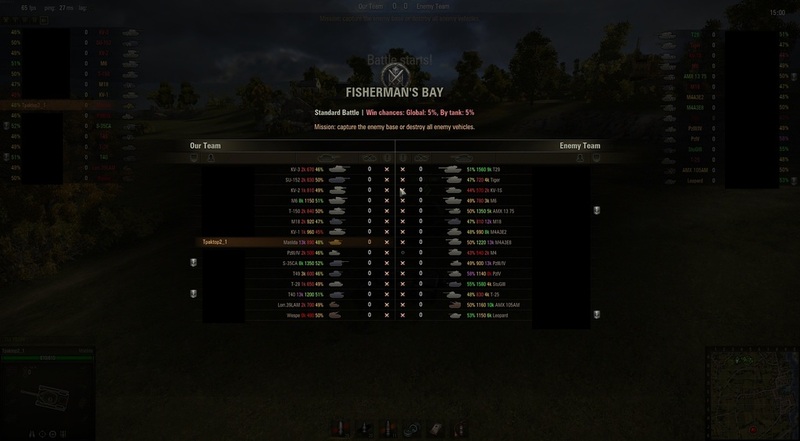 I assisted with three more, helped arty spot two, and we were rolling in on the base when I realized there were only three enemies left, five of us, and we were going to win. And we did. So much for saying I’d never use a mod. If anything, I’m going to tweak my config file because I don’t love the color scheme, and I am unsure of the ranges (What does it mean to be purple ? ).